The application for the 2019 UMVIM, SEJ summer internship program is now available. Applications are due by April 15th, 2019. Click the image for more info. 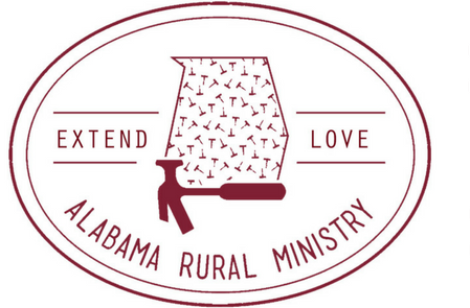 Alabama Rural Ministry is an UMVIM project in the Alabama-West Florida Conference. Due to the recent disasters, the tornadoes in Lee County and Hurricane Michael in the panhandle, they have expanded their ministry, while continuing their current work. There is a great need for mission teams this now and into next year. ARM can host a variety of teams and they have staff to assist with the work on the ministry. For more information, please click the image. 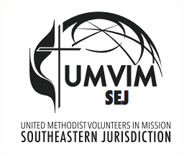 UMVIM, SEJ works in partnership with missionaries and organizations around the globe. Click here to take a look at our International, Domestic, Southeastern Jurisdiction, and Young Adult Mission Opportunity Lists. 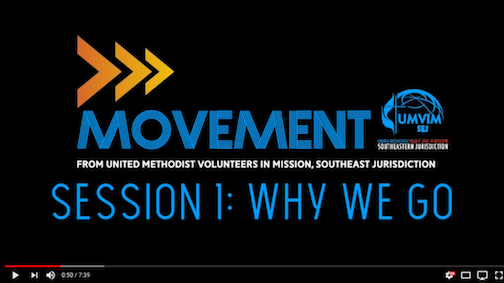 The "Movement" series will initially encompass three short videos designed for church and team leaders to initiate conversations surrounding mission theology and questions about service. Check out the first of the series, "Why We Go" by clicking the image. View the latest edition of the UMVIM SEJ Weekly Update newsletter. Scroll down to subscribe for weekly updates delivered straight to your inbox! Are you a trained team leader? Have you selected your project and gotten your team together? Great! The next step is to register your team. Start by clicking on this banner. United Methodist Volunteers in Mission, SEJ is the short-term mission sending agency of the Southeastern Jurisdiction of the United Methodist Church. 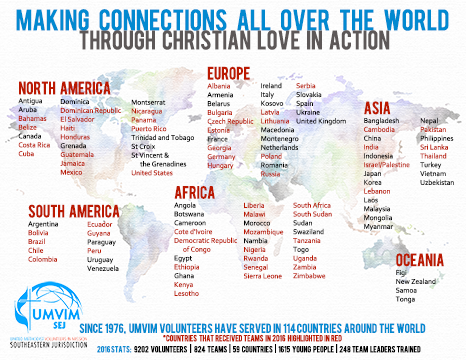 UMVIM exists to promote, encourage, and enable Christians to exemplify “Christian Love in Action” through short-term mission service at home and abroad. July 4-12, 2019. Alabama Honduras Medical Educational Foundation (AHMEN) and Carolina Honduras Health Foundation have openings for a medical mission team. This team needs medical volunteers: Doctors, PAs, NPs, RNs or Paramedics. The cost for this mission is airfare plus a $750 team fee. If you are interested or have questions, please contact Lou Altman at laaltman@netscape.net. September 6-16, 2019. Irwinton Toomsboro Salem UMC is taking a team to Havana/Camp Canaan Cuba to serve with the Cuban Methodist Church. This is a construction project team, but no construction skills are necessary. There will be a job for every team member. The most important thing about this mission is the the relationship being built with our Cuban brothers and sisters. The cost is $1800 all inclusive from Atlanta, GA. For more information or to join this team, contact Mike Burgamy, burgamy@bellsouth.net. Please be in prayer for the work that UMVIM Teams will do in 2019.